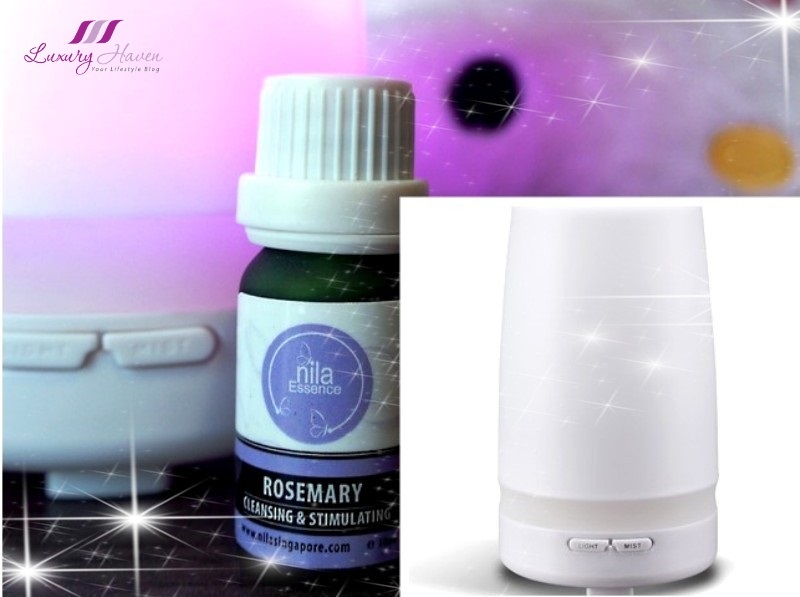 Do you know that choosing a good diffuser with ultrasonic feature is important to help diffuse the essential oil into the air, helping the oil molecules remain air-bound for hours to allow for healthy body absorption? These diffusers let you reap the benefits of essential oil anywhere in your home or office. 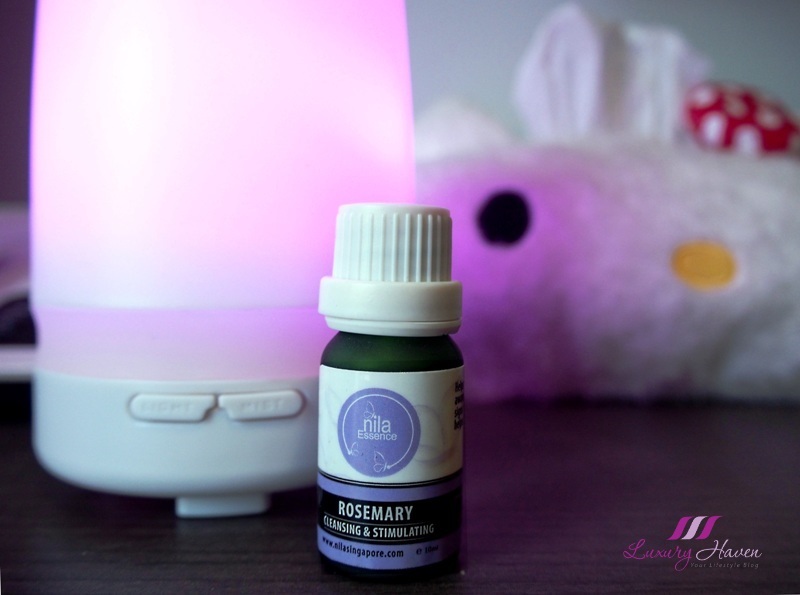 I like mine with mist which is expelled into the air adding moisture to my room, and I am enjoying the true aroma of the essential oil with the Ellestfun Ultrasonic Aroma Diffuser from Nila Aromatherapy Bar. 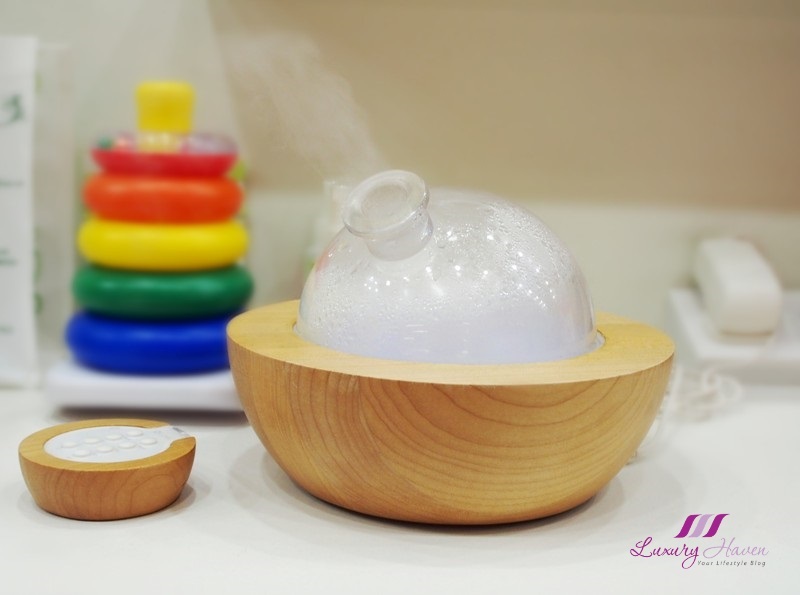 Nila carries quite a variety of diffusers like the Glass Dome Aroma Diffuser, and the Donut Aroma Diffuser etc. All readers of Luxury Haven gets 15% off their products at Nila Singapore! Well, I got myself the Ellestfun Ultrasonic Aroma Diffuser N004 at SGD 78, with a timer for me to set my preferred length of operation. I love the 7-colour changing LED light, where I can also set it on any one of the colours I like. Its features include the ultrasonic water-oxygen diffusing which produces healthy anions, and combining the benefits of aroma-therapy, aqua-therapy and light-therapy, generating an overall sense of well-being. Since I am placing the diffuser in my study room where I will be it facing every day, I picked the Rosemary Essential Oil ( 10 ml ), SGD 38. The properties include clearing the mind and improving memory and mental awareness. Also eases headaches, migraines, fatigue and signs of exhaustion. On the skin, its astringent action helps firm, decongest and reduce puffiness and swelling. Anti-Bacteria Essential Oil, SGD 200 ( 50 ml) and SGD 50 ( 10 ml ) - a blend of anti-bacterial Clove, Lemon, Cinnamon, Eucalyptus and Rosemary essential oils to keep bacteria and germs at bay and to improve our immune system. I was told that this is especially beneficial if any of us are feeling unwell. Insomnia at SGD 136 ( 50 ml) and SGD 34 ( 10 ml ) - a soothing blend of Lavender, Vetiver, Frankincense, Siberian Pine and Sandalwood essential oils that can help to relieve symptoms of everyday tension and stress that may lead to insomnia and poor quality of sleep. I use the Insomnia in my bedroom ( about 10 drops since I require a higher dosage ) whenever I have trouble sleeping, and I have to say it works pretty well. Nila Aromatherapy Bar carries a range of Signature Blends, which combine two or more pure essential oils blended together targeted at enhancing your well-being. * Important point to note: Pure Essential oils are highly concentrated, and NEVER to be applied to the skin undiluted, as it can be harmful and potentially cause severe irritation or sensitization. If they are to be applied topically, always dilute it by adding them to a carrier oil in the appropriate ratio. Back to the diffuser, I was recommended not to wash the it. Instead, get a bottle of the Nila Essence Disinfectant ( 110 ml ) at SGD 26 and use it to wipe the insides of the diffuser gently for maintenance. The disinfecting solution is infused with 100% pure natural Tea Tree and Lavender essential oils that makes a great alternative to commercial chemicals. The Essence Disinfectant has multiple usage besides using it to clean the diffuser. I can even spray it on shoes like my hubby's and son's to prevent bacteria / fungus growth and to remove odour! Are you into essential oils? 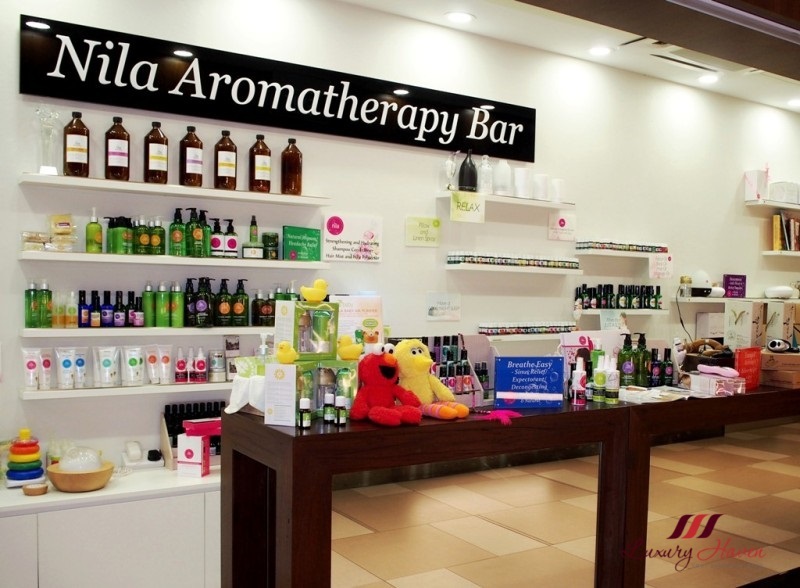 Get your special 15% discount at Nila Aromatherapy Bar just for followers of Luxury Haven! Learn more about the many benefits of essential oils at Nila Aromatherapy Bar, Your One-Stop Bespoke Essential Oils! 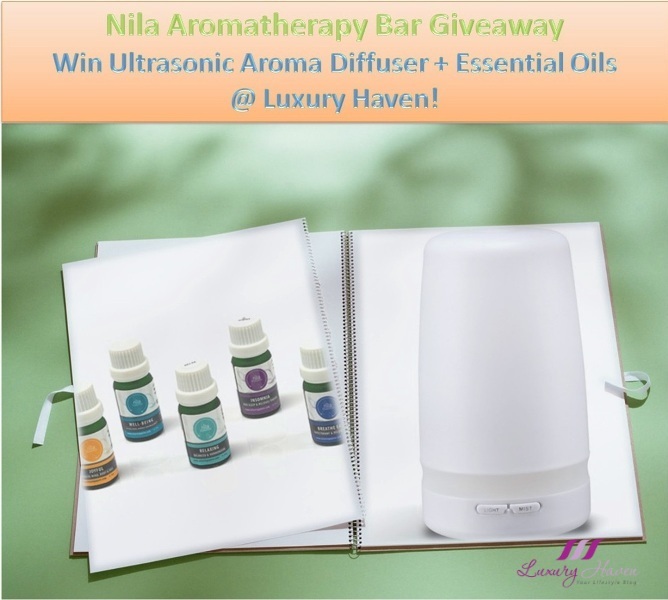 Come, join us in our 1st Nila Aromatherapy Giveaway to Win Diffuser and Essential Oils! Good luck to all your entries! *Closes 24 June 2016. Be sure to Subscribe to Luxury Haven by Email and you will never miss a post again! I love aromatherapy and these products look great! Great products! Must be very relaxing to have these aromatherapy. I like aromatherapy! Look like a great products! I enjoy aromatherapy oils so many purpose for it also hae several diffuser. I have yet to try out a diffuser yet. Maybe I will in my new house. Oh-so-nice, love it while I am cushioning for the night. Great products, I love aromatherapy! Nice giveaway! 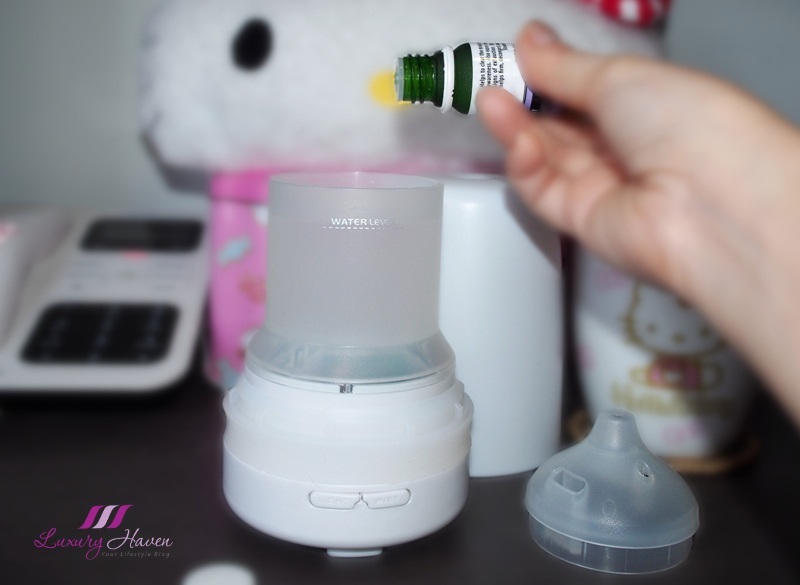 I use an ultrasonic diffuser and swear by it's benefits! A Nivea tem produtos maravilhosos! Bem interessante este difusor. Nunca tinha visto! I've never used aromatherapy products. It sounds like they have some good health benefits. I m in love with aroma teraphy and this product looks really so great! What a good discount for those who are using essential oils! Thanks for sharing! I love araomatherapy essential oils. I use it in my living room. This difuser is really cool! Nice review. The insomnia ones has my attention. I love aromathic essential oils! These looks very good and effective! This diffusers seems amazing! So great to hear about the discount, thank you for sharing. It's been years since I dabbled in aromatherapy. I never used a diffuser though and I do like the one you've got here. I love the colour changes!